Classic Curves Jewelry - This is a handmade delicate sterling silver pendant accented by an oval 24 mm x 10 mm Black Onyx cabochon. This beautiful elegant One-of-a-Kind necklace comes with an 18" sterling silver snake chain. 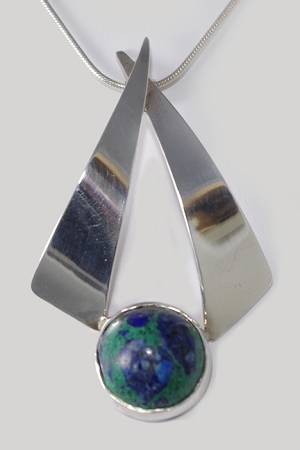 A beautiful round natural Azurite cabochon is framed by high polished Sterling silver. The necklace comes with an 18'' sterling silver snake chain.